Left: detail of “Turn on Spring” by Chelsea O’Sullivan. Right: detail of “Show Your Stripes” by Diana Leigh Surma. 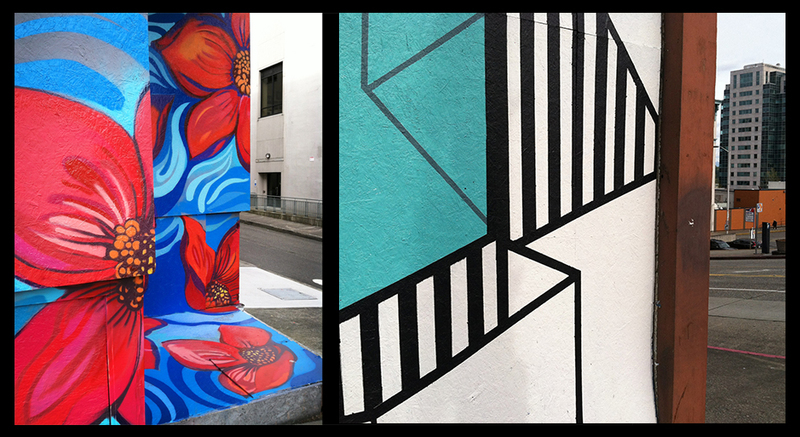 Artists Diana Leigh Surma and Chelsea O’Sullivan have given us two bright, and ambitious murals in downtown Tacoma! This Third Thursday marks the official debut of these new murals on the corner of 11th and Market. Chelsea and Diana completed their murals during one of the rainiest months of the year. After numerous cancelled painting parties with volunteers, the sun eventually showed up, and the brushes (and spray cans) hit the walls. Within a few weeks these two beautiful murals came to life. That should brighten things up a bit! Diana Leigh Surma‘s mural stretches 80 feet along Market Street. The mesmerizing, and cleanly executed design consists of huge, geometric, zig-zagging ribbons floating over a background of vertical black and white stripes. The work is titled “Show Your Stripes” and demonstrates it’s civic pride well through its long flowing stripes, and by activating this underused, yet critical section of downtown. Around the corner, sweeping down the hill, a network of colorful pipes are exploding with giant flowers being carried off into a rainy spring storm. Chelsea’s O’Sullivan completed this mural titled “Turn On Spring”, done mostly in spray paint. The brightly colored pipes and flowers are offset by the subdued grey and purple storm. This contrast of colors and imagery truly capture the feeling of spring. At the bottom of the hill, the flowers float around the edge of the building and settle into a nook, tucked away from the storm. These murals will be on display for six months, at which time Spaceworks will be choosing two new artists to bring their visions to the walls. Be on the lookout for the application this summer. Keep in touch by signing up for the Spaceworks monthly Newsletter. Hop on the Artbus for a chance to meet the artists, join the Easter egg hunt, and whatever additional shenanigans might be part of your ride. Click here to get tickets.